We are proud to adhere to AAHA's 2013 Dental Care Guidelines. We can now provide full service dentals for your pet. 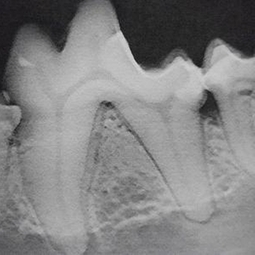 There are several advantages to having dental radiographs done before a dentistry like being able to see above the gum line to evaluate disease at the roots. Many times there are bone loss, decay, and infection that lies underneath and can only be detected with radiographs. Having this capability allows us to better perform oral management and save your pet from unnecessary pain from molar slab fractures, infected tooth pockets and more. If needed, we can perform oral surgery including extractions with gingival flaps and more.